If you don’t love a good piece of fried chicken you are not a real American. And if there is anything more fun to eat than fried chicken, it’s fried quail. 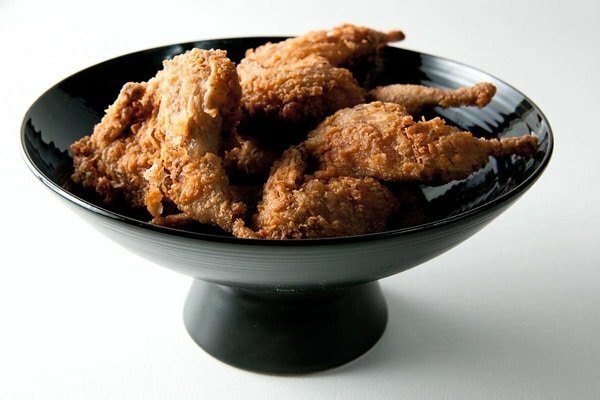 They taste more or less like chicken (especially when fried), and because they are smaller, it’s basically a party when a big bowl of them comes out to the table. Why? Because there is no way to eat them without just diving in. No forks, knives or other utensils needed. Your fingers are your only tools. Sweet, juicy meat. Salty, spicy, crispy batter. Oh man, you will find yourself scraping the batter off the ribs with your teeth you’ll want it so much. Don’t serve these at a fancy dinner party, unless you want to break the fussiness of the evening and force your friends to get their hands dirty — something I actually wholeheartedly recommend. Just have some extra napkins nearby. Beware: Holly and I once ate 10 of these little birds by ourselves. So make more than you think you need. A lot more, especially because they are almost as good served the next day as a cold lunch as they are piping hot. If you are working with real wild quail, I highly recommend you brine them before frying. A simple brine of 1/4 cup kosher salt to 4 cups water will do — the birds are going to get plenty of seasoning later. Submerge your quail in this brine for 4 to 8 hours. Store-bought quail don't need to be brined. As a general rule, 1 quail is an appetizer, 2 a lunch, 4 a good portion for a hearty eater. You can also do this recipe with chukars and Hungarian partridges. (I also have a similar recipe for buttermilk fried rabbit.) Serve with mashed potatoes, cole slaw, cornbread and collard greens. Mix the buttermilk with the all the spices (except the salt). Coat the quail with the mixture and set in a covered container for as little as an hour, and as much as 8 hours. When you are ready to fry, pour the oil into a large pan — a big cast iron frying pan or Dutch oven is ideal — and heat over medium-high heat. You want the oil to almost submerge the quail halves. Meanwhile, take the quail out of the buttermilk and let it drain in a colander. Don’t shake off the buttermilk or anything, just leave it there. Let the oil heat until it is about 325°F; this is the point where a sprinkle of flour will immediately sizzle. Do not let the oil smoke! When the oil is hot, pour the flour and salt into a plastic bag and shake to combine. Put a few quail into the bag and shake to get it coated in flour. NOTE: If you want your quail "extra crispy," let the battered birds sit on a rack until the flour absorbs the moisture of the buttermilk coating. Then give them a second shake in the flour bag. You'll get a much thicker, crunchier crust that way. Fry for about 4 to 5 minutes. Fry gently — you want a steady sizzle, but nothing raging, and you definitely don’t want the quail to just sit in oil. You might need to adjust the heat a bit. Turn the quail over and fry for another 3 to 4 minutes. You will probably need to fry in batches, so just leave the unfried quail in the colander until you are ready to flour them up and fry them. Don’t let the floured pieces sit. When the quail are good and fried, let them rest on a rack set over a paper towel to drain away any excess oil. Serve hot or at room temperature. @dustin – we raise quail in our backyard. There are several YouTube videos that show very humane slaughter/processing procedures. Plucking them is a bit of a pain, but the taste is undeniable (especially if southern fried). Brine is recommended for captive and hunted birds. I tried this recipe with 6 quail from Cavendish Game Birds. All I can say is WOW, AMAZING! I actually forgot to flour the first three birds, but they were just as tasty as the three that did get the flour. 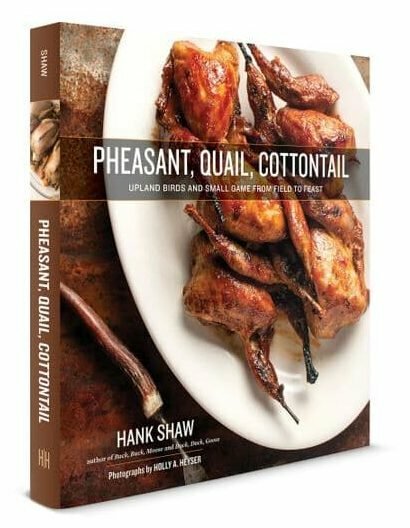 This is now my favorite quail recipe and I cannot wait to try it again! Thank you! !